Please note: This job is open only to residents of Herkimer County. The Herkimer County Industrial Development Agency is currently seeking a full-time Administrative Assistant to provide support to the Executive Director and Office Manager in a variety of areas. This position requires a high level of confidentiality, good organizational skills and the ability to be a team player. HCIDA Mission: Herkimer County Industrial Development Agency (HCIDA) is a public benefit corporation created by the Herkimer County Legislature under the NY State Industrial Development Agency Act. Its mission is to help create and retain job opportunities within the county by marketing the area to prospective new business and industry and by providing assistance to existing companies in the region looking to expand. The HCIDA serves as a coordinating agency for a variety of lending and financing programs offered by local, regional, state and federal agencies for the purpose of job creation and retention. RESPONSIBILITIES & DUTIES GENERAL: Answer phones, greet visitors, manage correspondence and monitor supplies; Create, maintain, and enter information into databases; Operate office equipment, such as fax machines, copiers, or phone system; Compose, type, and distribute meeting notes; prepare agendas and notices; Proficient use of e-mail using GOLDMINE for scheduling and disseminating information; Good knowledge or Microsoft WORD and EXCEL. FINANCIAL: Monthly reconciliation of bank statements, balance reports and loan fund documents; Assist with accounts payable, prepare project fee billing, record loan payments; Process and maintain records of check requests and reimbursements; Recordkeeping management regarding project files, company insurance and job tracking; Daily use of QUICKBOOKS. MARKETING FOCUS: Maintain agency website and Facebook account; Capture photos and information about agency events and developments for media use; Occasional use of Microsoft POWERPOINT; Represent the IDA at various meeting and events. REQUIRED KNOWLEDGE, SKILLS & ABILITIES Knowledge: Clerical-Knowledge of administrative and clerical procedures and systems such as word processing, managing files and records, designing forms, and other office procedures and terminology; English Language-Knowledge of the structure and content of the English language including the meaning and spelling of words, rules of composition, and grammar; Customer and Personal Service-Knowledge of principles and processes for providing customer and personal services. Skills: Writing-Communicating effectively in writing as appropriate for the needs of the audience; Active Listening-Giving full attention to what other people are saying, taking time to understand the points being made, asking questions as appropriate; Reading Comprehension-Understanding written sentences and paragraphs in work related documents; Speaking-Talking to others to convey information effectively; Time Management-Managing one’s own time and the time of others. Abilities: Oral Comprehension-The ability to listen to and understand information and ideas presented through spoken words and sentences; Oral Expression-The ability to communicate information and ideas in speaking so others will understand; Written Comprehension-The ability to read and understand information and ideas presented in writing; Written Expression-The ability to communicate information and ideas in writing so others will understand. MINIMUM QUALIFICATIONS: (1) Associate’s Degree and 2 to 4 years’ experience in office management; (2) Salary commensurate with experience; (3) Herkimer County residency required. Applicants to mail or E-mail their resume and cover letter to: ATTN: Stacey Holleran, Office Manager, Herkimer County Industrial Development Agency, 420 E. German Street, Suite 101A, Herkimer, NY 13350 E-mail: sholleran@herkimercountyida.org Deadline to apply is 4:00 PM, Monday, March 11, 2019. No phone calls or in-person inquiries about the position please. Speedway Now Hiring Manager Trainees! 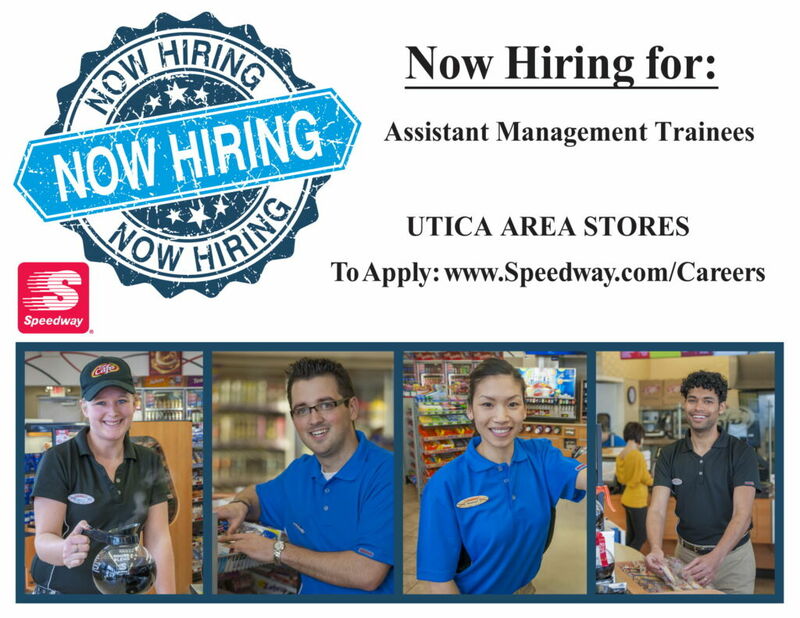 Speedway in Utica is looking for Assistant Manager Trainees. Full time for Speedway in Utica, NY. Assistant Manager is a full time management position with advancement opportunities for all levels at Speedway. If you enjoy working as part of a management team and have previous supervisory experience as an assistant manager, team lead, or key holder, Speedway would love the opportunity to talk with you. Immediate eligibility and vesting for 401k plan with a company match of $1.17 per dollar up to 6% of annual salary begins upon enrollment. Coverage in medical, dental, life, and vision insurances eligible upon enrollment. Paid vacation and sick pay plans. Weekly paychecks and paid holidays. Tuition Reimbursement and Adoption Assistance. Oversee and provide customer service leadership, training, and coaching, alongside the General Manager, for all store employees. Maintaining high employee retention by focusing on identifying qualified applicants, developing leaders, empowering employees, and encouraging employee productivity. Maintaining a clean, safe environment by complying with all health and sanitation procedures to ensure the store and foodservice area is presentable and that all products are in-stock. Assist in implementing all merchandising and marketing programs in order to ensure the foodservice area maximizes sales and profits while maintaining asset controls. Cash handling, fuel transactions, and promoting the Speedy Rewards loyalty program. Ordering products, managing inventory levels, and verifying deliveries. A valid Driver’s License from the state of residence and auto insurance in order to conduct area pricing surveys. A high school diploma/GED or college degree. Interested candidates can apply online at www.Speedway.com/Careers. The NY State Office of General Services is looking for a cleaning/maintenance worker. The job order is below. Full time for the NY State Office of General Services in Oriskany, NY. Applicants must be physically able to perform the tasks of the position and able to understand and carry out written or oral instructions. When required to operate motor vehicles, incumbents must possess a valid New York State driver’s license appropriate for the type of vehicle being operated. Clean buildings, facilities including restrooms and restock supplies. Perform routine maintenance and repair of buildings, facilities and surrounding grounds using the appropriate tools and equipment. Perform other maintenance tasks such as collecting and disposing of trash, mowing lawns and snow removal by shovel or powered snow removal equipment. Move furniture and equipment in the performance of custodial functions. Replace light bulbs, wash and dust fixtures, furnishings, floors, corridors, stairs, stairwells and partitions using appropriate supplies and equipment including ladders and scaffolding. Pick up and remove hazardous articles from floors and equipment and place them in designated receptacles of appropriate locations. Ability to work at heights using ladders, scaffolding, platforms and boom lifts. Ability to operate small equipment including lawnmowers, snow blowers, weed eaters, floor buffers, vacuums, etc. Pay is $12.70 per hour. Health benefits after 45 days. To apply for this vacancy, candidates should submit a cover letter along with a clear and concise resume detailing how you meet the minimum qualifications for this position as listed above to HRresumes@ogs.ny.gov. Be sure to indicate the Position Title-Facility Operations Assistant 1 -Oriskany and Vacancy ID number 18-361-GP. RCIL is expanding. There are new positions available. Danfoss is looking for a Production Operator. To learn more about the position, click here. Cooks, Bartenders and Wait Staff. Full and part time positions. We are hiring Cooks and Bartenders and Wait Staff for the upcoming season. Pay will be discussed at interview and it depends on experience. Please apply at The Sanctuary, 728 Court Street, Utica, NY to fill out an application or email resume to kiersnowskirich@gmail.com. LutheranCare in Clinton is looking for CNAs for 2nd and 3rd shift. Full or part time, generous benefits and sign on bonus. $1,000.00 SIGN ON BONUS FOR Full Time, 2nd Shift- 2pm -10pm and 3rd Shift- 10pm-6am, working every other weekend positions available. Reporting any health issues to the supervising nurse. Taking care of a Resident’s personal hygiene. Feeding Residents and serving nutritional supplements. Making beds and keeping the Residents’ space clean and tidy. Transporting Residents within the Facility. Rewarding position with outstanding benefits. Free health care, dental and vision coverage for full time employees and family health coverage benefits for part time employee. FE Hale Manufacturing in Frankfort is looking for good candidates for a Machine Operator and a Finish Sprayer position. Full time for F.E. Hale Manufacturing in Frankfort, NY. Days and hours: Monday through Thursday 6:00 am to 4:00 pm with overtime possible. A manufacturing operator is responsible for performing variety of mechanical tasks. Must have the ability to learn the operation of manufacturing equipment and manufacturing processes. Work with saws, planers, molders, lathes or similar machines. Must be capable of setting and operating vintage as well as newer wood working equipment. Must be able to read calipers and tape measures. Must be able to perform maintenance on various equipment used in the plant to ensure that that products meet established quality standards. Must be capable of meeting production targets and ensuring that environmental health and safety regulations are adhered to during the manufacturing process. High School diploma or the equivalent preferred. 2-4 years of woodworking experience in a manufacturing environment preferred. Willing to train a candidate with related experience and a genuine interest in the woodworking trade who is willing to learn company equipment and production processes. Interested candidates should email a resume to matt@halemfg.com. Under direct supervision, this position performs any of a variety of functions involved with the finishing of wood products, including sealing, staining and painting with the goal of manufacturing a quality part according to Work Order specifications while meeting quality and production standards. Specific duties may vary depending on assigned department. This position flexes in relation to the production demand. Include the following. Other duties may be assigned. Applies spray sealer and top coats. Applies spray stains and wipe stains. Matches stains and finishes to custom colors. Repairs parts, as needed. Performs quality checks according to quality standards. Maintains basic preventive maintenance on spray booths and equipment. Keeps work area neat and clean according to company standards. Works safely and follows all company rules and procedures. Education and/or Experience: High School Diploma or equivalent preferred. Minimum 6-months experience working in a manufacturing environment; or equivalent combination of education and experience. Functional working knowledge of general hand tools and paint sprayers. To apply, E-mail a resume to: matt@halemfg.com .